I gave myself a 3-day weekend to ensure I had time enough to do my usual weekend collapse as well as planting flowers and/or herbs/veggies in the front and back gardens. The front is along the Grand Central Parkway, so although it has lots of sun, I wouldn’t want to plant edibles there what with all the soot and exhaust fumes. Of course, planting the front garden was not necessary in years past, but since Metro Management vandalized my tree, I’ve had to cover what was formerly covered by the blue spruce’s branches with flowers. The blue spruce’s roots are far reaching and shallow, so digging in the soil is precarious. 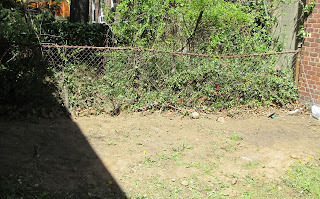 Therefore I decided to create a “moat” of sorts, not dug in but built up with fencing and topsoil mixed with peat moss. OK, I can not only not draw straight lines, I can’t make a border (or whatever) that is consistently 8 inches across. The result may be a bit lopsided, but it has ... character. I then planted some pretty red and pink flowers, some white pansies, something resembling 8 inches apart. Hopefully they’ll fill in. Water water water. Out back I planted some veggies, which are always an experiment: a zucchini plant, a cucumber plant, and a crookneck squash. Then I piled a bunch of pink petunias into a couple pots, and watered all. Not bad. Mulch. The front and back new plantings in the new topsoil should be protected with mulch. By this time the aching from carrying seven bags of top soil around was already setting in, so I decided the rest would wait until tomorrow. So on the third day of my weekend, I set off in the morning to the local hardware store, with a little wheely thing in tow. There were workmen digging away near the laundry room, so I determined not to do laundry only to have it covered with dirt on the way back. I assumed they were Verizon employees, who had marked the locations of Time Warner’s underground cabling some weeks earlier, I suppose so they don’t cut them while digging new trenches to lay Verizon Fios cable inside pipes. The pipes didn’t look awfully sturdy to lay i’ the cold ground. Out here in the boondocks, we don’t have “city blocks” to make judging distances easy, but the hardware store is about a block past my morning bus stop, which is approximately five city blocks from my front door. Winters I’ve carried home my Christmas trees from the same block, and it’s easy. But a big bag of mulch? Probably not. Alas, they didn’t carry mulch at all, so I’d have to drive somewhere. The closest supplier I was sure would carry mulch was the Home Depot on Metropolitan Avenue, “around the corner” (a very large corner) from the supermarket, so away I went, combining chores, and praying to get the same parking spot on my return. With a large bag of mulch in the trunk, two flats of red and pink impatiens on the back seat (must vacuum back there!) plus several bags of groceries later, I got an even closer parking spot to my front door. Frabjous day. But what’s this? A bunch of guys sitting on my front stoop and the step of the apartment opposite me, having their lunch. Equipment, shovels, stuff. These must be the Verizon guys, but now they’re digging between my building and the next. It seems unlikely that I’m going to work in my front yard with these guys there, so I leave the mulch in the trunk, and lug in the groceries. Returned for the two flats later, so now they’re sitting out back. Out back: a guy with a machine that digs trenches. It’s odd to have a motor turning over in my back garden, a disconcerting sound. 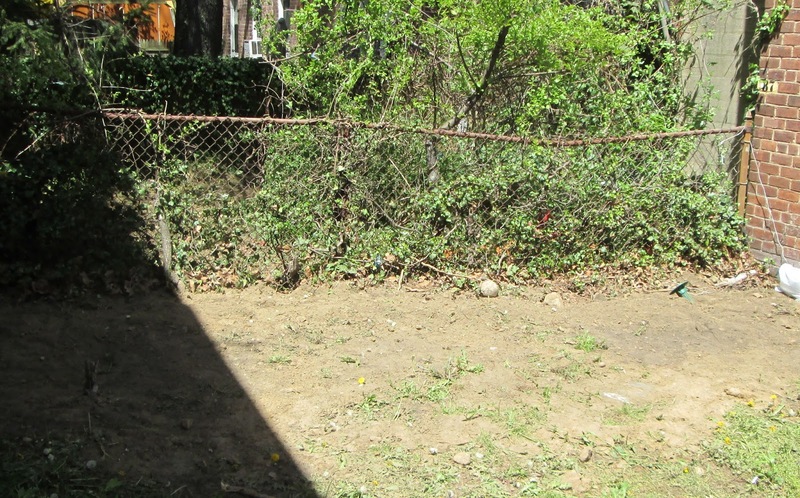 The machine driver and I cleared my pots and plant tables and birdbaths from the path of the machine (most of which are technically not in my territory, which is the width of my apartment – the no man’s land where he wanted to dig a trench to the cater-corner building is covered in weeds and vines. Maybe they’ll get rid of some of those.). He said he’d put them all back, but I doubted it. Note: Tuesday, he has not moved it all back. Over the last several days as I worked in the garden with the wonderful soil, I started deepening an annoying cold and cough I’d picked up somewhere. My aches became less muscular and more flu-like. Sigh. Now my head is too heavy to do anything but photograph the long mound in between my building and the next. Too long for a grave. There are young men in the back again today, digging and covering the trench to the cater-corner building. Now I have lumpy graves. If I feel better later, maybe I’ll break out the mulch. ~ Molly Matera, signing off. Unfortunately not cleaning up the back garden until the weekend comes. Once a year, some of us, we few, we happy few — or, as my cousin calls us, people with greasepaint in our blood — celebrate Shakespeare’s birthday. Why celebrate the birth (and death) date of someone who wrote over 400 years ago, is not in my family tree by any stretch of the imagination, and is recalled as school days torture by the majority of people I talk with every day? Because listening to and reading Shakespeare sharpens my mind and has afforded me great pleasure over the years, as well as being the first building block in a number of friendships that have blessed my adult life. I am grateful, more than once a year, to the Bard and those actors/directors/teachers/friends who taught me how to take his words in and make them mine, in particular Eric Hoffmann and the late Robert Mooney. The year’s wheel has come full circle, so I started writing down all sorts of fascinating things about Shakespeare, but then I had too much of a good thing, so I had to stiffen the sinews and start from scratch. While setting goals for next year (for which I intend to plan ahead, just as I probably did last year for this), I’ll move apace with this year’s musings. 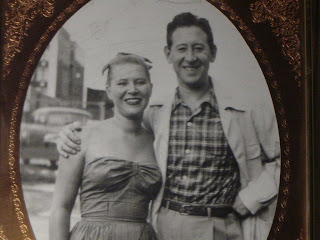 Once a year my friend Horvendile posts to his blog, A Likely Story, a list enumerating things he’s done — how many poems he’s written, how many plays, short stories, how many pints of Guinness or bottles of wine drunk, among other things (and thereby hangs a tale), as well as every play he’s attended. Many of the last will overlap with my list of plays seen because we cannot get enough Shakespeare. 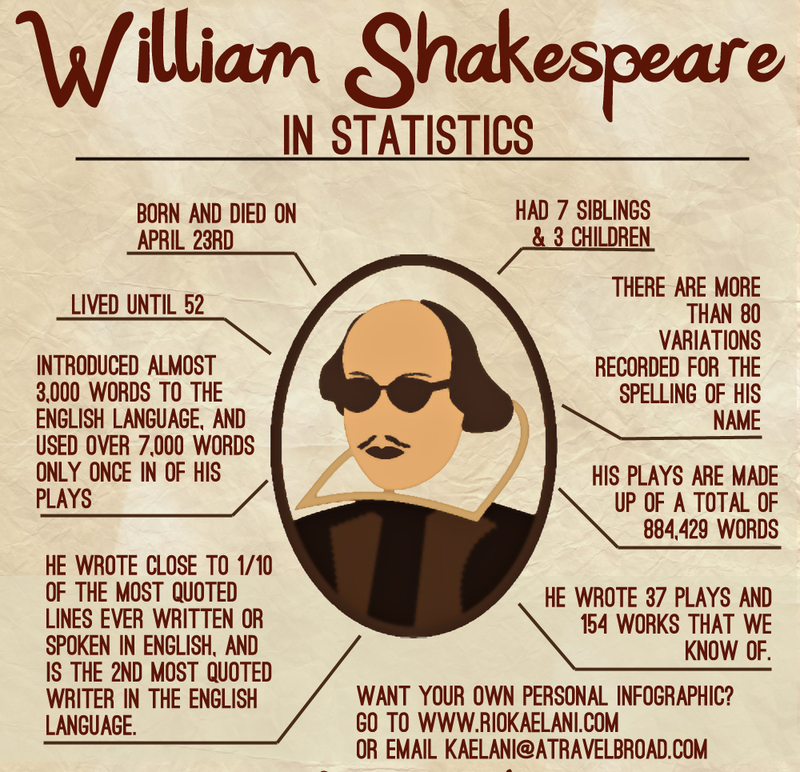 I come to list Shakespeare, not to praise him, the plays and books I’ve seen and/or read that were by or about Shakespeare in the year since I last posted to the Happy Birthday Shakespeare Blog. What would be impossible would be to list how many of Shakespeare’s phrases I have heard in everyday conversation without anyone realizing the debt. There are too many to count, so that way madness lies. 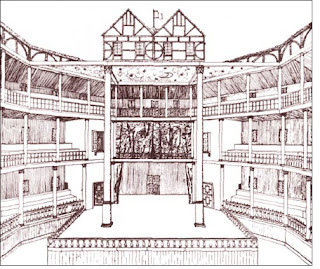 Last year I blogged about the role Shakespeare played in my theatrical experience in terms of performing and directing. I said it then and I’ll say it again: I’m no scholar or academic, and my experience with Shakespeare is certainly neither as consistent nor as long as I would like. Still I remember learning to scan, learning how the verse (or lack thereof) can inform an actor more than 400 years on how to say a line, what it means, where the stresses go. This is a remarkable gift. (Or curse, when the actors strutting their hour onstage mangle the verse, which is why it can be so rewarding to experience the stories anew in a foreign tongue.) So although I haven’t acted Shakespeare in some time, I continue to attend productions of his plays several times a year, I re-read some of the plays each year and someday soon I’ll re-read the entire canon, preferably aloud with friends. Will was busy, so Artie posed in a ruff. Ruff. (c) 2013 Eric Johnson Jr.
As summer 2012 dawned, I saw the NYC Public Theatre’s delightful production of As You Like It on a perfect evening at the Delacorte in Central Park. Droll and heartfelt, it transported us all to joy. In October we trekked to lower Manhattan to see a production of Hamlet from Shakespeare’s Globe. I called it a Wee Hamlet because of the charmingly compact set the company traveled with and the short playing time — due to the very fast delivery of a streamlined script. A representation of The Globe in London. In November we journeyed to the Brooklyn Academy of Music for an unusual production from the Netherlands — it was an all-day affair featuring news crawls, newsreels, no intermission, however imbibing, wandering and tweeting were allowed. This was Roman Tragedies, which is a mash of Coriolanus, Julius Caesar, and Antony & Cleopatra, by the Toneelgroep Amsterdam. It was close to six hours, mostly fascinating. Oh, and it was in Dutch. No, I do not. In the new year, a delightful Much Ado About Nothing (by the same company that did a marvelous Taming of the Shrew last year, Theatre For a New Audience at the Duke Theatre in Manhattan) and most recently the Royal Shakespeare Company’s Julius Caesar at the BAM Opera House. 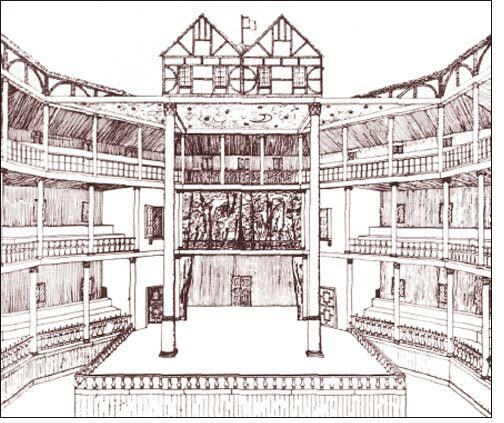 A few decades ago (guess the year), my friends Judy and Alan and I purchased the best bargain of our lives — New York’s Public Theatre intended to perform the entire canon of Shakespeare over the course of five years, and we paid up front what then appeared to be an enormous sum to subscribe. For that investment, we saw all of the plays at least once, with extra productions over a period that stretched beyond those original five years, including reserved seats even at the summer venue, the Delacorte! Final tally: $11 per performance. The like will never come again. One of those friends is Alan Gordon, author of the Fools Guild Mysteries whose latest publication is an essay in the new book Living With Shakespeare, an anthology of essays by writers, actors, directors, and others edited by Susannah Carson and Harold Bloom. This book has given me hours of delight and I’m not even halfway through. The evening before Shakespeare’s birthday, the editor and several contributors chatted about the book and Shakespeare and the plays at the National Arts Club in Manhattan. An evening’s discussion among friends and strangers about Shakespeare — who could ask for more on the eve of the Bard’s birth. Also in 2013, looking forward to (I can practically hear Carly Simon singing “Anticipation”) Joss Whedon’s “home movie” of Much Ado About Nothing due in theatres in June. 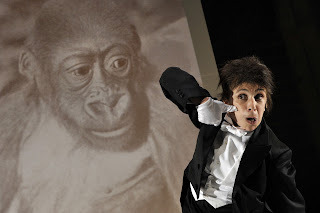 Then… whatever productions at BAM or elsewhere catch my eye. Just when there was too much time between live theatre productions, Public Television provided the exciting Shakespeare Uncovered series, with Jeremy Irons, David Tennant, Derek Jacobi, Trevor Nunn, Joely Richardson, and Ethan Hawke exploring the texts, the sources, the lore of spending a life performing or directing Shakespeare. Videos (or DVDs, I have both) recently watched include Roman Polanski’s Macbeth with Jon Finch, Francesca Annis, and Martin Shaw. I saw this on a high school field trip to Manhattan in the early 1970s. Just as the nuns hadn’t realized that Romeo and Juliet would show some bare flesh in Franco Zeffirelli’s 1968 film of Romeo and Juliet (how short-sighted of them! ), I don’t think they realized the witches and Lady Mac would be naked — after all, the moors and stone castle floors of Scotland are quite chilly…. What I remember most clearly about the trip to see Macbeth was my friend Carolyn’s nails leaving marks on my arm when Macbeth’s head was lopped off by MacDuff. With no malice aforethought but rather this birthday blog in mind, I’ll take note of anything Shakespearean that may come my way over the next twelvemonth….and once again I’ll post it to the website dedicated to bringing together people who blog and love Shakespeare and … whatever else the Happy Birthday Shakespeare bloggers do at this year’s celebration of the Bard’s Birthday. ~ Molly Matera, off to re-read Coriolanus before I view the DVD…. On Wednesday I caught the last (for now at least) performance of Aaron Mark’s one act play Another Medea upstairs at the Duplex. This is not a modern Medea. It is not Medea in drag. It is not funny, although it has some good laughs as human dramas always have. It is a conversation about how someone comes to lose himself so completely that he does dreadful things. It is an exploration, an investigation, and it is heart-breaking. We are not complicit in the acts, we don’t approve, but we are filled with dread as we comprehend. Tom Hewitt walks onto the Duplex stage as the Writer, a tall and handsome man, unassuming, and a bit uncertain. He is here, he tells us, to talk to Marcus, who hasn’t spoken to anyone in years, but after a lengthy correspondence has agreed to talk to this unnamed writer. He is unnamed because this is not about him. It’s about Marcus. The stage is empty but for a table, with a file folder on it, and a chair. Mr. Hewitt walks behind the table and sits in the chair facing us. Once he removes his glasses, he becomes Marcus. Marcus, an actor who must tend bar to make ends meet and shares a Queens apartment with two others, is in his 40s when he discovers love. This man holds us rapt in his gaze for over an hour. He tells us a story and plays all the parts in it, without ever leaving that chair. His face and his voice become other people in the split second it takes for dialogue to bounce back and forth. Mr. Hewitt, while barely moving his body, becomes ten people during the play. Playwright and director Aaron Mark asks many questions in this modern study of ordinary people which finally resolve into a story that all too closely parallels that of Medea. He questions human fascination with that awful story century after century after century. In Another Medea, Marcus’s lover is even named Jason. Near the end, Jason denies doing and saying something that starts the spiral toward destruction, and it was all I could do to keep from crying out “You LIAR! 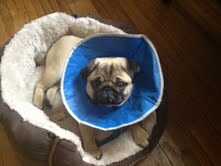 You did!” We are invested in Marcus, feel his joys and his hurts. Empathy in the situation brought about by Marcus and Jason and Jason’s sister (all played by Mr. Hewitt) holds us in our seats until the final horrific moments. Then silence falls. Mr. Mark’s script is intricate, layered, emotional, and chockful of life even though it runs just over an hour. Mr. Hewitt’s performance is breathtaking and awe-inspiring. Another Medea at the Duplex was an intimate piece in an intimate space, and that makes for a powerful evening of theatre. Keep an eye and ear out for a return of this play. On Thursday I saw a production of August Strindberg’s The Dance of Death in a new adaptation by Mike Poulton. We’d looked forward to the Red Bull Theater’s production because we’d enjoyed the company’s productions several times in the past year or two. Alas, the evening played only two notes — one each for the usually charming Daniel Davis as Edgar and one for the shrill Laila Robins as Alice. A cipher appeared as the third character in the overlong first act. The best part of the second act was that Ms. Robins found a second note, and that it was shorter than the first act. 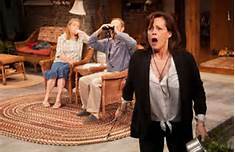 Director Joseph Hardy created no levels, no rhythms, no reason for anyone to go the long way west to the Lucille Lortel Theater. Oh well. We’ve seen lots of good stuff lately, and were due for a disappointing dud. ~ Molly Matera, signing off to ponder her birthday present to William Shakespeare. I have a fondness for the play Julius Caesar. Several years ago I directed a staged reading of it with an all female cast, and it was an enlightening experience. For instance, despite the fame of certain speeches in this play (not as many as in Hamlet, but still, enough), each and every one sounded new coming from a woman. Equal we are to men, but different indeed. Design by Michael Vale. Photo (c) 2012 Kwame Lestrade. Schoolkids are often forced into reading and reciting Julius Caesar, what with its nifty, time-saving combination of history and literature. And it’s true that, while technically a tragedy, this is one of Shakespeare’s historical-ish plays that doesn’t stray too far from the original source material. Who’s to say how far the original source material strayed from the facts, the setting down of which always depends on the politics of the time. At any rate, most of the time your Mark Antony, your Marcus Brutus, your lean and hungry-looking Cassius are pretty much what you’d expect, but not in the current production by the Royal Shakespeare Company playing at the Brooklyn Academy of Music (through 28 April). This production is set in 20th Century Africa, where all sorts of dictators, liberators, and military leaders have been rising and falling and toppling in the last several decades. 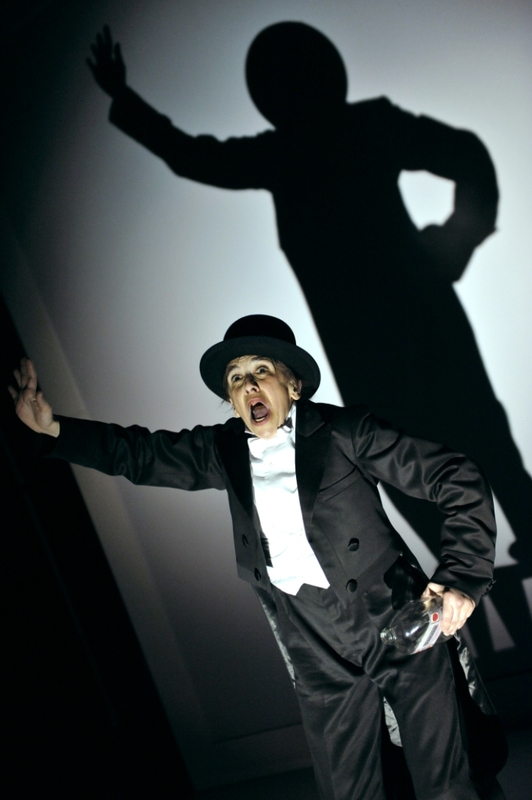 Despite the modern setting, modern technology does not interfere in the telling of this story; rather, the lighting (Vince Herbert) and sound (Jonathan Ruddick) designs effectively help it along. The storm preceding the Ides of March is thrilling, with deep dark rumblings and flashes to frighten anyone. Theo Ogundipe as the Soothsayer. Photo by Kwame Lestrade. 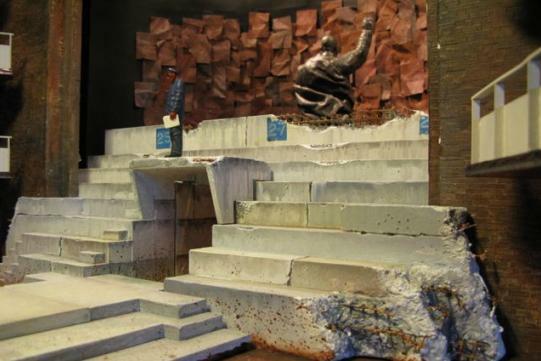 Michael Vale’s scenic design is earthy and practical, an imaginatively off-kilter setting that provided not only multiple levels for playing, but tunnels, or caves, and many steps. This is all topped by an imposing, outsized statue of Caesar, his back to the audience. Think what might happen to statues of dictators in the 20th Century. Vale also designed the costumes which, despite a hint of Roman togas, were decidedly not European. Lively and vibrant music by Akintayo Akinbode and dancing (movement by Diane Alison-Mitchell) introduce us to the citizens of “Rome,” who open the play celebrating their leader, Caesar, in the heights of rapture. That first scene foreshadows the people’s thoughtless reactions to come. Theo Ogundipe’s Soothsayer is covered in ash powder, painted to alternately stand out from and blend into the desert. He draws us from the ecstatic dancing and singing to moments of stillness as he speaks silently, questioning, looking upward. He dances, he talks, he lurks, and he finally pronounces the fateful words to Caesar: Beware the Ides of March. Ray Fearon as Mark Antony. Gregory Doran, the RSC’s Artistic Director, directs this play briskly, powerfully, building on relationships, looks, whispers. Although the play runs close to three hours, Mr. Doran doesn’t allow us to feel it for a moment. The acting was generally excellent (although some of the African accented English was difficult to understand, noticeably Mark Antony). Despite this, our ears become accustomed to the speech, and physically Ray Fearon was a remarkable Antony, a canny alpha male who can cajole, calm, and incite his listeners. It is Antony that becomes the hero of the piece as Brutus and Cassius and their faction diminish. Paterson Joseph presented a strange interpretation of Brutus as a glad-hander instead of a stoic, as if he had found Brutus’ entire character in his admonition to the conspirators on that first night in his garden, when they came with faces hidden from the darkness. He urged them not to mask themselves but rather to hide the conspiracy “in smiles and affability!” This jovial Brutus is an unusual choice, but it worked toward a fine balance of the driven characters. Poor Cassius was totally screwed and we felt each slight by Caesar as Cyril Nri showed us the reality of a man who is no longer preferred, no longer a part of the in crowd. He is filled with fear, paranoia, and resentment. 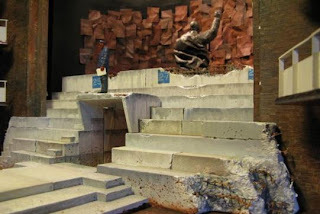 In this production it was always clear that everything Cassius said was smart, and each time Brutus denied him, Brutus’ ego diverted and weakened the plan and his co-conspirators. Brutus and Cassius over the body of Caesar. Joseph Mydell’s Casca was witty and malleable. Jeffery Kissoon’s Caesar was a jealous old man, a corporate kingpin with the power of life and death, chilling in his ordinariness. Several members of the company, like Ricky Fearon and Jude Owusu, had a fine time playing disparate roles. Simon Manyonda, as Brutus’ servant Lucius, was engaging in each scene, whether sleeping or waking. As for the women, Calpurnia seemed to barely exist in this production, although the image of Portia did linger, particularly in the reactions of Lucius, Cassius, and Messala (Chiké Okonkwo) to her death. This is a forceful and vibrant production, a new interpretation of a story that still remains the same. If you’ve seen Julius Caesar, you haven’t seen one like this. If you haven’t, go learn a little history, listen to a little music, and love a lot of Shakespearean tragedy. ~ Molly Matera, signing off to re-read the play yet again. Finks is a powerful piece of theatre with a lot of laughs. 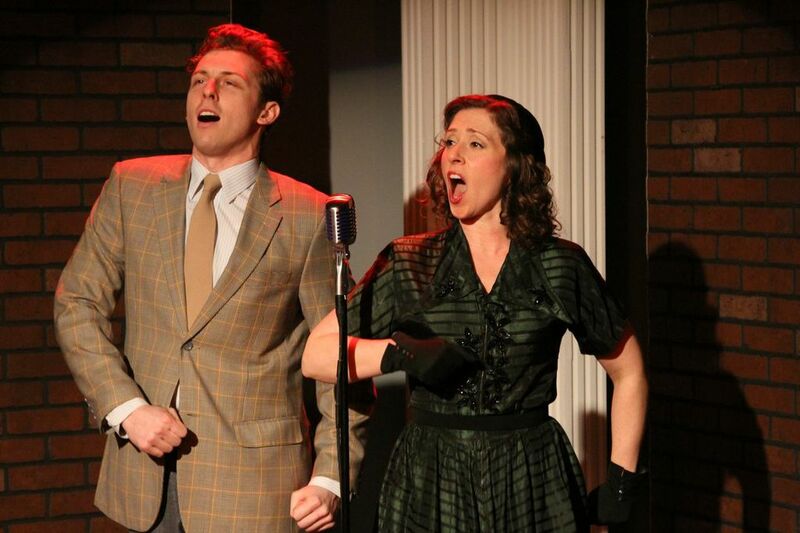 The Ensemble Studio Theatre and The Radio Drama Network produced Finks at EST, which tells the story of two performers, Mickey and Natalie, who in real life translate to Jack Gilford and Madeleine Lee Gilford. Other characters don’t align precisely with just one person during the McCarthy Era, but I guarantee you’ll be looking up actors, directors, choreographers from the early 1950s when you get home after seeing Finks. The story of the play resonates as if we were transported back to 1951 as flies on the wall. Looking back, we know the Gilfords survived their ordeals, if only by watching Mr. Gilford’s work in A Funny Thing Happened on the Way to the Forum with Zero Mostel, who was also “blacklisted” for most of the decade. Nevertheless, careers were derailed and these victims and their families were punished for the better part of a decade for no crime. 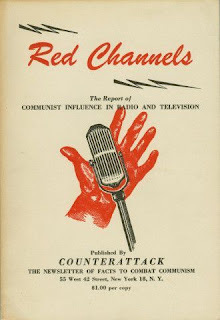 The “blacklist” (which was really a booklet called Red Channels listing whomever was named by anyone) was enforced by private corporations like Proctor and Gamble and Kellogg’s who pressured radio and television networks not to employee actors named in the book. The sickness that was the McCarthy Era touched education and politics as well. Finks is a well-structured play, intriguing, and well written by Jack and Madeleine Gilford’s son, the playwright Joe Gilford. The action goes back and forth between the Committee meeting room (its heavy wooden desk always present onstage and hovering), the club where we first see Mickey perform, Mickey and Natalie’s home, theaters, clubs, living rooms. Giovanna Sardelli directed briskly, creating with her actors the right rhythm for each scene. Choreography by Greg Graham was fun and exciting and perfectly performed by Miriam Silverman as Natalie and Leo Ash Evens as Bobby. 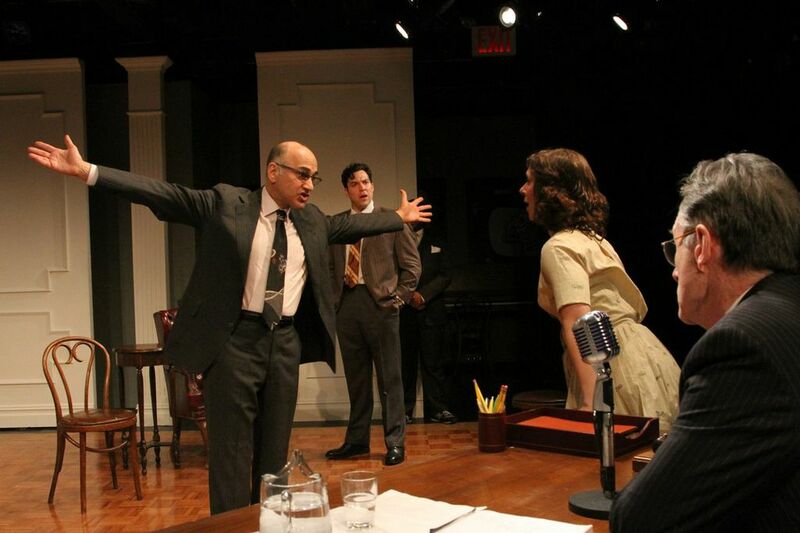 The storytelling is electric, building to the explosive events of the HUAC hearings and winding down to the denouement of unemployment because of the blacklist. The scenic design by Jason Simms was clever and simple enough to fit many locations, and Sydney Maresca’s costume design was on the mark, as was Jill BC DuBoff’s sound design. Leo Ash Evens as Bobby and Miriam Silverman as Natalie. (c) 2013 Gerry Goodstein. 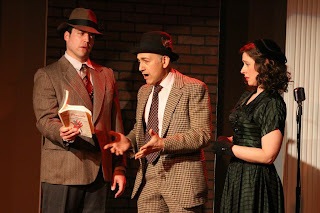 Aaron Serotsky was excellent as Mickey Dobbs (a.k.a. Gilford), a stand-up comic, singer, and actor, on the way up in the entertainment world. When he meets and falls for Natalie, he describes her perfectly as “Emma Goldman in Paulette Goddard’s body.” Serotsky’s depiction of Mickey is simple and sweet, and we care deeply for him as he struggles to maintain his career while remaining true to his beliefs — he’s not demonstrative the way Natalie is, but once he’s with her, he’s with her all the way. The tireless Natalie — actress, singer, dancer, activist and steadfastly loyal friend — was played by Miriam Silverman with gusto, enormous energy, warmth, and certainty. Natalie and her dancing partner and friend Bobby (Leo Ash Evens) created a small group within the actors’ union who leaned left to seek aid for those in need. She was also Bobby’s beard, which is all swell until someone (read lawyers working with the Committee) blackmails Bobby. The list of people who named names back then is shocking, and when it is enacted before us — friends naming friends — it is heartbreaking. Finks is what they are to Natalie, with no sympathy for their human weakness. Mickey has more empathy, perhaps fearing he hasn’t the personal courage to stand up to the Committee. Ned Eisenberg is just marvelous as Fred Lang (a combination character, including Zero Mostel, but without Mostel’s survival ability) — funny, angry, and frightened, a man who eloquently took the 1st* — as had the Hollywood Ten — and was, along with many others, sent to prison for it. Eisenberg looks nothing like Lou Costello but does a fine impersonation of him. Finally it’s Mickey’s turn in front of the Committee, and we hold our breath, as uncertain as he is, waiting to see how he will answer the call. Eisenberg, Serotsky, Silverman, and Michael Cullen. (c) 2013 Gerry Goodstein. All performances were excellent, with some actors playing and clearly differentiating multiple roles, including Thomas Lyons, Kenney M. Green, and Jason Liebman. Michael Cullen was straightforward as the self-assured Representative Walter bullying all who came before him. This is seriously good theatre, worth the walk (or cab) to 11th and 52nd Street. Finks is only running to the 21st April at EST (http://ensemblestudiotheatre.org/finks-joe-gilford), so put it in your schedule. * Congress shall make no law respecting an establishment of religion, or prohibiting the free exercise thereof; or abridging the freedom of speech, or of the press; or the right of the people peaceably to assemble, and to petition the Government for a redress of grievances. ~ Molly Matera, signing off. There’s so much more reading to do about what happens when we’re not looking….